Wherever and whenever live music is played—in Naples, Florida, or otherwise—people of a certain age will often request a song made famous by the late and great Louis Prima. Last season in Naples at The Cafe’ on Fifth Avenue, when I had the privilege of playing with the great trumpter Bob Zottola, a customer approached me and requested that we do something by Louis. Zottola, to his eternal and idealistic credit, is a music guy, not an entertainment guy, but wanted to honor the customer’s request. “No, unfortunately, there isn’t,” I told Bob. Louis was never a darling of the jazz critics. We did “Oh Marie” anyway and the crowd loved it. Bob was really cooking on that one. It couldn’t be helped. Prima’s sound was and is an electrifying, timeless and swinging one that transcended labels, genres, timelines or categories. In his early days, Louis was a good, traditionally oriented trumpeter and singer out of the Louis Armstrong mold, but as time went on, he moved farther and father away from jazz into the world of entertainment. Prima continued, with varying degrees of success and with changes in music policy—he was almost doing a rock and roll show at one point in later years—until he lapsed into a coma in October of 1975. He died in August, 1978. 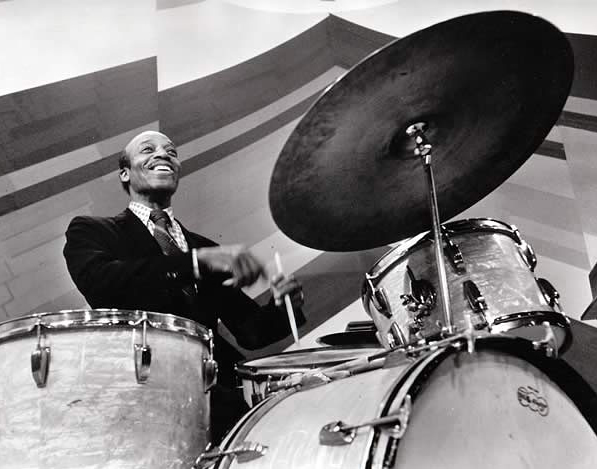 Prima’s drummer on and off since the early 1940s was a superb player by the name of Jimmy Vincent, who died on April 15, 2002. You can hear Vincent wailing away on some of Louis’ most famous songs, including “Jump Jive and Wail,” “Just a Gigolo” and all of the rest. Vincent also had a good deal of success with another, semi-famed, Las Vegas-based lounge group called “The Goofers.” Drum fans, in particular, may remember Vincent appearing in ads for the Slingerland Drum Company, where he was wearing a monkey mask. Vincent never cared about critics. If you wear a monkey mask while playing the drums, that’s obvious. 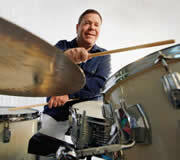 But Buddy Rich, among well-known players, is said to have loved him. No one could play the shuffle beat like Jimmy Vincent. Vincent was an important figure in this area, having helped pioneer and perfect the shuffle beat on drums, an important component of early rock. At about 10 a.m., a few minutes before our taxi was scheduled to arrive in Philadelphia, Joy’s daughter, Lauren, called us at home. “Turn on the television, now,” she told her mother. There it was. The tragic bombing of the Word Trade Centers. Live, on television. We didn’t believe what we were seeing. The taxi had arrived to take us to the airport. My first thought was to call the airport to see if planes were still flying. Whomever answered the phone at the airport said that nothing had changed, Planes were still taking off. The trip to Vegas never happened and we never hooked up with Jimmy Vincent, who passed away about a year and one-half later. Bob Zottola has spoken often about doing that number when I come back to Naples.